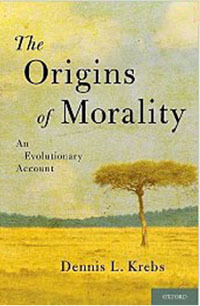 The Origins of Morality: An Evolutionary Account. by Dennis L. Krebs. New York: Oxford University Press, 2011. 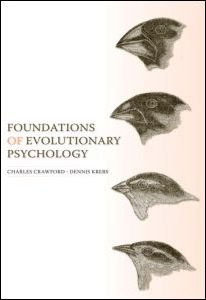 Foundations of Evolutionary Psychology by Charles Crawford & Dennis L. Krebs (Eds). Taylor & Francis, 2008.
and Applications by Charles Crawford & Dennis L. Krebs (Eds. 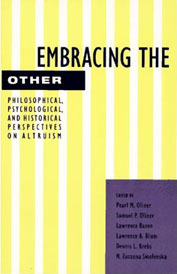 ), Erlbaum, 1998.
the other: Philosophical, psychological, and historical perspectives on altruism by Pearl Oliner, Samuel Oliner, Lawrence Baron, Lawrence Blum, Dennis L. Krebs & Zuzanna Smolenska (Eds. ), New York Press, 1992. Sociobiology and Psychology: Ideas, Issues and Applications by Charles Crawford, Martin Smith, & Dennis L. Krebs (Eds.). Hillsdale, N.J.: Erlbaum, 1988. Psychology: A First Encounter by Dennis L. Krebs & Roger Blackman. Harcourt Brace Jovanovich, 1988. Readings in Social Psychology, Contemporary Perspectives (2nd Ed) by Dennis L. Krebs. Harper-Row, 1981. Readings in Social Psychology: Contemporary Perspectives by Dennis L. Krebs. Harper-Row, 1977. Here I have provided some of my more recent works, key articles and some others that are hard to find. They are all in PDF format and you will need Adobe Reader to view them. For a complete list of my publications, see my Curriculum Vitae. Krebs, D. L. (2011). How altruistic, by nature? In S. L. Brown, M. R. Brown, & L. A. Penner (Eds.). Self interest and beyond: Toward a new understanding of caregiving (pp. 25-38). New York: Oxford University Press. Krebs, D. L. (2011). The evolution of a sense of morality. In E. Slingerland and M. Collard (Eds.) Creating Consilience: Evolution, Cognitive Science, and the Humanities (pp. 299-317). New York: Oxford University Press. Denton, K. & Krebs, D. L. (2011). Reworking Darwin: The good, the bad, and the ugly of human psychology and human organizations. Journal of Organizational Moral Psychology, 1, 15-28. Krebs, D. L. (2011). Review of F. de Waal’s The age of empathy: Nature’s Lessons for a Kinder Society. Journal of Moral Education, 40, 125-127. Krebs, D. L. (2010). Born bad? In H. Hogh-Olesen (Ed.) Human Morality and Sociality-Evolutionary & Comparative Perspectives. (13-30). UK: Palgrave Macmillan. Krebs, D. L. (2010). Morality. I. Weiner & W. E. Craighead (Eds.) Corsini Encyclopedia of Psychology (pp. 1021-1023). Hoboken, NJ: John Wiley and Sons. Krebs, D. L. (2010). Extending the reach of higher education inside and outside the classroom. In I. Hay (Ed.). Inspiring Academics. Learning with the World's Great University Teachers (pp. 150-155). London: Open University Press. Denton, K. & Krebs, D. L., (2010) Altruism and leadership. In R. Couto (Ed.). Political and Civic Leadership (pp. 623-629). Sage Publications. Krebs, D. L., & Denton, K. (2009). Benign folie a deux: The social construction of positive illusions: Commentary on Mckay & Dennett. Behavioral and Brain Sciences, 32, 525-526. Krebs, D. L. (2008). Forward. In Strachan, W. Writing-intensive: Becoming W-Faculty in a new writing curriculum. Utah State University Press. Krebs, D. L. (2008). Morality: An evolutionary account. Perspectives on Psychological Science. Krebs, D. L. (2008). The evolution of a sense of justice. In J. Duntley and T. K. Shackelford (Eds. ), Evolutionary Forensic Psychology. Oxford University Press. Krebs, D. L. (2007). Deciphering the Structure of the Moral Sense: A Review of Marc Hauser’s Moral Minds: How Nature Designed Our Universal Sense of Right and Wrong. Evolution and Human Behavior. Evolution and Human Behavior, 28, 294-298. Krebs, D. L. (2007). Understanding evolutionary approaches to human behavior. Human Development, 50, 286-291. Krebs, D. L. (2006). The nature of altruism: Ultimate determinants and proximate mechanisms. Psychological Inquiry, 17, 48-50. Krebs, D. L., & Denton, K. (2006). Explanatory limitations of cognitive-developmental approaches to morality. Psychological Review, 113, 672-675. Krebs, D. L. & Climenhage, L. J. (2005). The nature and nurture of morality. Evolutionary Psychology, 3, 133-141. Climenhage, L. J. & Krebs, D. L. (2005). From helping to hand grenades: Setting the bar for altruism. Evolutionary Psychology, 3, 208-215. Krebs, D. L. & Denton, K. (2005). Toward a more pragmatic approach to morality: A critical evaluation of Kohlberg’s model. Psychological Review, 112, 629-649. Krebs, D. L. (2005). The evolution of morality. In D. Buss (Ed.) The Handbook of Evolutionary Psychology, (pp. 747-771). John Wiley & Sons. Krebs, D. L. (2005). An evolutionary reconceptualization of Kohlberg’s model of moral development. In R. Burgess & K. MacDonald (Eds.) Evolutionary Perspectives on Human Development, (pp. 243-274). CA: Sage Publications. Krebs, D. L. (2004). Cultivating morality and constructing moral systems: How to make silk purses from sows’ ears. In C. Crawford & C. Salmon (Eds.) Evolutionary Psychology: Public Policy and Personal Decisions, (pp. 319-342). Mahwah, NJ: Erlbaum. Krebs, D. L. & Janicki, M. (2004). Biological foundations of moral norms. In M. Schaller & C. Crandall (Eds.) Psychological Foundations of Culture, (pp. 125-148). Mahwah, NJ: Erlbaum. Krebs, D. L. (2003). Fictions and facts about evolutionary approaches to human behavior: Comment on Lickliter and Honeycutt (2003). Psychological Bulletin, 129, 842-847. Krebs, D. L., Denton, K., Wark, G., Couch, R., Racine, T. P., Krebs, D. L. (2002). Interpersonal moral conflicts between couples: Effects of type of dilemma, role, and partner’s judgments on level of moral reasoning and probability of resolution. Journal of Adult Development, 9, 307-316. Krebs, D. L. (2000). The evolution of moral dispositions in the human species. In D. LeCroy & P. Moller (Eds.) Evolutionary Perspectives on Human Reproductive Behavior. Annals of the New York Academy of Science, Vol. 907, pp. 1-17. Krebs, D. L. & Denton, K. (1999). On the relations between moral judgment and moral behavior. In D. Garz, F. Oser, & W. Althof (Eds.) The Context of Morality. Frankfurt: M. Suhrlcamp. Krebs, D. L. & Laird, P. (1998). Judging yourself as you judge others: perspective-taking moral development, and exculpation. Journal of Adult Development, 5, 1-12. Wark, G. & Krebs, D. L. (1997). Sources of variation in real-life moral judgment: Toward a model of real-life morality. Journal of Adult Development, 4, 163-178. Janicki, M. & Krebs, D. L. (1998). Evolutionary approaches to culture. In Crawford, C. & Krebs, D. L. Handbook of Evolutionary Psychology: Ideas, Issues, and Applications, pp. 163-207. Hillsdale, NJ: Erlbaum. Krebs, D. L. (1998). The evolution of moral behavior. In C. Crawford & D. L. Krebs (Eds.) Handbook of Evolutionary Psychology: Ideas, Issues, and Applications, pp. 337-368. Hillsdale, NJ: Erlbaum. Krebs, D. L. & Denton, K. (1997). Social illusions and self-deception: The evolution of biases in person perception. In J. A. Simpson & D. T. Kenrick (Eds.) pp. 21-47. Evolutionary Social Psychology. Hillsdale, NJ: Erlbaum. Krebs, D. L. & Van Hesteren. (1994). The development of altruism: Toward an integrative model. Developmental Review, 14, 1-56. Krebs, D., Denton, K., Vermeulen, S.C., Carpendale, J.I., and Bush, A. (1991). The structural flexibility of moral judgment. Journal of Personality and Social Psychology: Personality: Processes and Individual Differences, 61, 1012-1023.Reprinted in B. Puka (Ed.) (1994) Moral Development: Field of Schemes. Hamden CT: Garland. Krebs, D.L., Vermeulen, S.C., Carpendale, J.I., and Denton, K. (1991). Structural and situational influences on moral judgment: The interaction between stage and dilemma. In Kurtines, W. and Gewirtz, J. (Eds.). Handbook of Moral Behavior and Development: Theory, Research, and Application, Erlbaum, 139-169. Denton, K. and Krebs, D. (1990). From the scene to the crime: The effect of alcohol and social context on moral judgment. Journal of Personality and Social Psychology, 59, 242-248. Krebs, D., Denton, K., & Higgins, N. (1988). On the evolution of self-knowledge and self-deception. In McDonald, K. (Ed. ), Sociobiological perspectives on human behavior. Springer-Verlag, pp. 103-139. Krebs, D., & Miller, D. (1985) Altruism and aggression. In G. Lindzey and E. Aronson (Eds.) Handbook of Social Psychology (3rd Edition). Random House, 1-71.